Nice Fischer Price find!! And for a great price! I love to buy and sell toys! Its a chance to be a kid again. I recently found the cutest yard game set its Chicken Croquet..but its missing one ball, and the directions were in bad shape. I saw one complete in box listed for $45.I could transcribe the directions...and if I can find a generic ball the same size...so Ill hang onto it for a while and see what happens! Sondra - I know what you mean. It's fun to buy toys because then you get to play with them! Good luck with the Chicken Croquet, hope you score big with it....Dude! Kimberly - I hear ya. How about when they print out an eBay listing they've found and they tape it to their item as a comparison? That's a big turn off for me. You're exactly right. I want to bark at them, "This ain't eBay....we're standing in your driveway!" But like you, I stay mum, no good would come out of that anyway. There are few things I hate more than customers who print out eBay/Amazon listings as a "guide" for their asking price. But there was one that happened to you in this blog. I comment further down (or up; however the comments work here). Sean- You have a good memory. That was that sewing equipment piece I bought at my local Thrift Store.Yes, that one actually worked in my favor as they wanted, I think, $40 for it, but they printed an eBay listing showing one selling for a few hundred. I wish more sellers would do it that way-Ha! Thanks Pam! Good luck with that Coleman stove....Dude! Well, I can tell you that there are people who think they can get lots of money for their Lego. I'm following a guy on CL that wants $250 for 25 lbs and says he's negotiable. I was bold and offered $50, but he said he wouldn't go less than $200. It's been listed for about 3 weeks. I kinda hoped he might text me back with a counteroffer, but he hasn't. He'll be lucky to get someone to fork over $100 for it. Lorraine - Hopefully you can wear him down once he realizes he overpriced his Legos. Makes you appreciate those sellers who sell them for a song just to get the stuff out of the house. btw-You are becoming a Lego expert. Maybe you should dedicate a blog just to that stuff-HA! On eBay, most bulk Lego sells for about $5 a pound. So to be fair, he wouldn't be lucky to get $100 as that would still be below eBay price. But $250 is funny. I don't go to garage sales because I don't have a car but our thrift store has an all over the place pricing. For example, a Starter coat (Chicago Bulls) was priced at $20 while a Harley Davidson nylon jacket was priced at $5 Today there was a wall hanging of Mary and Baby Jesus and it was in some other language (maybe Russian) they wanted $4 for it and then there was a Mele wood jewelry box for $2 I bought the box and will wait for 50% off day to get the wall hanging. Oh and some of their toys are ridiculous. Like $8.99 for this vintage spinning merry go round type toy but only $1.59 for a vintage fisher price drum set. Thanks for sharing the story.....Dude! At one recent yard sale, they wanted $5 per stuffed animal. It always seems people can't give away stuffed animals at yard sales, but they always mark them with high prices. I also find people want high prices for children's clothing. My goal is always no more than $0.50 per piece. I love when I find a toy from my childhood. I am still looking for a little floral scented doll that sat in a plastic flower that opened when you put water in it. I don't remember what it was called but I remember playing with it a lot. I think you may be talking about Strawberry Shortcake dolls? Check them out on eBay. If you can snag a plush doll of 50 cents and flip it for big bucks, that is da bomb! I wish I was more versed on plush dolls. Some of my fellow bloggers seem to do really well with them, but you got to know what to look for. After posting I was determined to find out what they were called. I spent too much time on google and finally found them. They were called "Luv Buds" produced by Buddy L. They aren't nearly as cute as I remember, but I would still love to find one. I loved Strawberry Shortcake, too (and Rainbow Brite)! I find the same thing - if someone tells me "what" something is they are setting me up for a higher price. I know, right? It's a common tactic. But us "professionals" are wise to it - Ha! I definitely think all these television shows like "American Pickers" and "Storage Locker Idiots" is creating a mass delusion among the public that ALL their crap is worth big bucks. It is always a safe strategy to go back to the overpriced garage sale towards the end. When the host sees all their items still sitting there they are much more likely to bring their prices down to earth. 'A dollar in hand is worth 10 of talk' really hits home at the end of the sale more than the beginning. Great post and good score on the Little People. Peter- I couldn't agree with you more. Another culprit is that Antique Roadshow. Read a pretty good book by Maureen Stanton who discusses this how phenomenon in one of her chapters. (see below review) Everyone thinks they have hidden treasure in their house! I have gone back to some yard sales to check on stuff that was overpriced. Sometimes you get lucky and the overpriced item is still there, but now marked down. Thanks for writing in and liking the blog...Dude! So the other thing that I can't STAND that happened to you is the "educating seller." 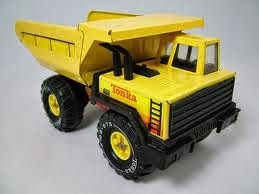 "It's a Tonka!" Really? You don't say? I had no idea. I hate that. If I've asked how much they are asking and they throw that back at me, I remain straight faced and unimpressed and say, "Ok. How much are you asking?" Then I still get the crazy asking price and I dismissively return the item back to the spot. If they follow up with an eBay price or some other such thing, I just say, "Oh yeah?" in a rather disinterested tone or a chuckle and say, "That's what people ask. That's not what they sell for." and leave it at that. It irks me so. As for Fisher Price Little People, that's a great find. However, be warned that it must come with the people, animals, accessories, etc. Don't bother if it is just the building or airplane or similar such thing. Those are practically worthless on their own. In fact, I've sold just the people for big bucks. And when you start getting into the characters, like the Sesame Street Little People, it's even better. Sean - I agree, the money is in the figures and accessories, not the buildings. However, if I bought it as a set, I usually won't break it up. Occasionally I negotiate with the seller and get them to agree to just sell me the accessories, leaving them with the building. It can be a hard sell, but some go for it. Oh, no doubt. I wasn't advocating leaving out the buildings. Just putting it out there to avoid buying ONLY the buildings should someone happen to come across them. And if you can get the people and accessories only from a set like the garage or larger airport, score! I like garage sales that have older folks running the sale. Most of them are trying to get rid of their junk (my treasure) and are very negotiable. We recently went to an Estate sale (run by pros). The homeowner was quite the collector and had amazing collections of all kinds of neat things. However, the prices were ridiculous. We wanted to stop by at the end of the estate sale to see if the would be more willing to negotiate on the prices, but never got a chance to. This guy probably had 100 different collections. From old leather handmade belt buckles, to vintage/antique rolling pins, to photography equipment, old glass, etc. It was fun just looking through everything. I've stopped going into professionally run estate sales. The prices are always awful. Never remotely close to "garage sale" prices so I don't bother. I just keep driving. I don't know how so many of them have "followings" and loyal customers. Margaret-I agree with you and Sean. I am not a big Estate fan either. Prices are always inflated to pay for the cost of the "professionals" running it. Secondly, they always seem to be more crowded then a typical garage sale and for what? Higher prices? I don't get it! Thanks for sharing your Estate story...Dude! I agree. A lot of sales have insane prices and they're almost always accompanied by stubborn sellers. Best to avoid them when possible and move on, lest the frustration set in. Amen to that! Thanks for checking in....Dude!